22 November 2017: CorkBIC and its partners have today launched the first International Security Accelerator in Ireland, which will offer an investment of €50,000 to teams in the wider security industry. The Accelerator is supported by key funding partners Kernel Capital and Trend Micro. The deadline for applications for the Accelerator, which will run over 13 weeks, has been extended until December 8, 2017. For more information, visit isa.corkbic.com. A core group of experienced international mentors, including Ronan Murphy, CEO of Smarttech, and Robert McArdle, Director of Trend Micro's Forward Looking Threat Research team, will offer targeted advice to the Accelerator participants. The startups will also have access to CorkBIC’s extended network of over 400 mentors worldwide. Worldwide spending on security-related hardware, software, and services is forecast to reach $119.9 billion in 2021*. As a neutral, stable country, Ireland is a highly sought-after location, with the top five worldwide security software companies based here. This world-class accelerator programme, which begins in January 2018, is aimed at early stage, disruptive companies in the wider security industry, including Cybersecurity, Internet of Things (IoT), Smart Cities, Health & Bioinformatics, Defence, Critical Infrastructure, Financial Services, Logistics and Transport. The successful participants will also have access to CorkBIC’s extensive international network of investors such as International Business Angels and Angel Syndicates through Investor Demo Days. Welcoming the Accelerator, Ann Doherty, Chief Executive of Cork City Council, said the launch of the International Security Accelerator will further cement the city’s reputation as an emerging cybersecurity hub. 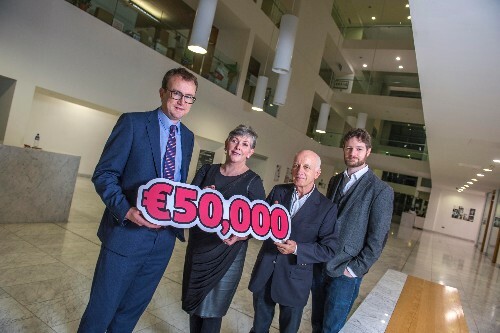 “Cork City Council is delighted that the CorkBIC Accelerator programme is our first client at our new co-working space at Cork City Hall. The development of the co-working space, where the start-ups will be based, is a key part of Cork City Council’s innovation and entrepreneurship strategy. And, today’s launch is a great example of partners working together to further develop the strong startup support ecosystem that has developed across the city in recent years”. Partners for the International Security Accelerator are Kernel Capital and Bank of Ireland, Trend Micro, CorkBIC and Cork City Council.